This is the first post in a new series, Identifying Your Photographs. In it, I'll take your unidentified historic photographs of the greater Cleveland area and try to determine where they were taken. The posts will include illustrative details on the subjects, and, when possible, photographs of the scenes as they are today. In addition, I will explain how I was able to identify the locations, so that you might be better able to look at the historic photos in your own collection. This photograph, posted on Flickr by a friend, was a challenge. It is of a gleaming new Cities Service (now CITGO) gas station. The images was likely made in the early 1920s, based on the cars in the garage and the years Cities Service Oil operated. The service station has eight gasoline pumps and four air compressors for vehicle tires. It features six service bays, at least two of which were use at the time of this photograph. A neon sign, advertising Cities Service Oils' brand, Koolmotor gasoline, stands in front of the structure. The bricks that made up the structure were glazed, most likely white in color, with a band of darker bricks at ground level. The roof appears to be made of stamped enameled steel - similar in composition to what might be used on the exterior of a stove or washing machine. Flanking the main door are two towers with display windows. The towers appear flimsy, in comparison with the rest of the station. Close examination reveals that the upper part of the windows was just painted on. The station was likely a corporate design, one of many similar structures. It bears much similarity to one featured in this entry, in the Encyclopedia of Oklahoma History and Culture. Note that the towers in that photo appear to be more substantial, with glass in the upper parts of their windows. The pitch of the roof, the proportions, and some other style elements, namely the cast-iron gutter heads, bear some resemblence to the Tudor-style houses built at the time. It bears some similarity to a group of structures with stronger Tudor elements built in the Cleveland area by Standard Oil. This one, on Euclid Avenue in East Cleveland is among them. 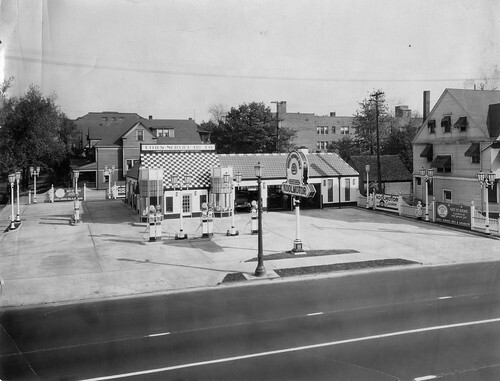 This is the gas station as it stands today, at 8201 Carnegie Avenue, in Cleveland, Ohio. I was unable to obtain the same perspective as the original photographer, who either used a ladder or a perch on a building on the other side of the street - this is as close as I was able to get. Much of the basic form of the building remains. An addition to the front provides a bit more office space, at the loss of the towers, which, as noted above, seemed a bit flimsy. It retains the basic configuration of service bays, and of most of the window and door openings. Even the small awning over the side door remains. The enamel steel roof is still present, an indicator of the durability of the material. This gas station is a testament to the adaptability of commercial structures, especially when keeping up with the latest style isn't a concern. This is not to say that much hasn't been lost, too. The cast iron lights that illuminated the gas station at light are long gone, as are the sconces in a complementary style on the outside of the building. The orginal gutters and cast iron gutter heads are gone from the front of the structure, but appear to remain, at least in part, on the side of the building. The houses, both on the side street and to the right of the station are no longer present. Nor is the three story brick building, probably apartments, seen to the right and rear. How Did I Identify It? First, I looked at the Historic Plain Dealer, 1945-1991, a great database that I detailed back in December. 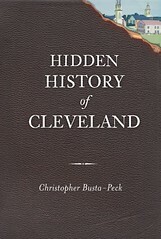 Note: a Cleveland Public Library card is required for access. I looked for Cities Service ads, with the hope that they would list the locations of their gas stations. While I found plenty of their ads, they did not include any addresses. The old city directories in the History and Geography Department at Cleveland Public Library would likely include the addresses for the service stations. If it wasn't the 30th time you've contacted them this month, a brief call (216-623-2864) would probably get you a list of their addresses. However, I'm stubborn and have to look things up for myself. Next, I looked to see what other information might possibly be contained in the photograph. The most obvious is the angle of the sun, which tells us that the building isn't on the south side of the street. Photo by The Heiser Co., Commercial Photographers, Cleveland. Annotations by the author. The photograph was, thankfully, scanned at a very high resolution. This revealed much detail, and made identification of the building possible. In the center of the image, on a street light, there is a sign, "Carnegie", outlined here in red. This meant that I was looking for a structure on the north side of Carnegie. After using Bing Maps "birdseye" imagery to browse the area from downtown to about East 70th Street, I was reasonably convinced that the building was gone. I took a new look at the image, this time not looking for identifying characteristics of the gas station, but for other landmarks that might help me figure out where it had been sited. The houses, while of good quality, didn't possess any special characteristics that would make them stand out. 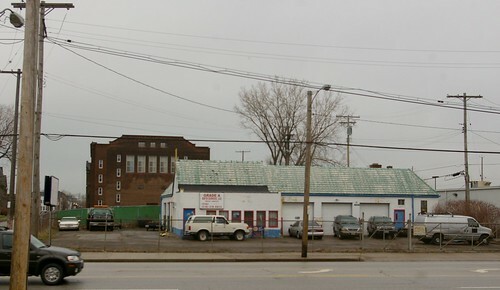 The building in the background, to the left, outlined in blue, however - it had a unique shape - one I initially assumed to be a theater. After a bit more browsing, the shape became familiar. It was the rear portion of the Euclid Avenue Temple (now Liberty Hill Baptist Church), at 8206 Euclid Avenue. With this information, locating the spot on Carnegie was easy. Much to my surprise, the station was still standing. It's an interesting structure, one I would have thought I would have paid more notice. Awesome work. Will keep an eye out for any high-res pictures!